A pond pump is the heart of a man-made pond. A pond pump circulates and aerates the water which helps to maintain a healthy pond environment. There are two basic types, a submersible and an external pump. But, not all ponds need a pond pump as we will go on to explain. The closed ecosystem of a garden pond needs to be carefully managed. A pump creates water movement and splashing sounds most people associate with having a pond. But, there are ponds that can thrive without a pump and still be healthy. Wildlife and natural ponds can be home to amphibians, insects and micro-organisms (invertebrates) all living together harmoniously. With life they all excrete waste into the water adding nutrients to the system. High nutrient levels along with sunlight encourage algae growth. The presence of algae in a pond can start to choke out pond inhabitants affecting the natural ecosystem. It is therefore in the interest of a pond owner to ensure such conditions don’t happen. In a wildlife pond clean, oxygenated water is possible without the presence of a pond pump. It’s own environment becomes the filter. In a man-made pond, particularly those home to Koi, it is almost impossible to prevent algae from flourishing without the presence of a pond pump and filter system. In a garden pond – whether a preformed mould or pond liner is used in the build, there aren’t the natural substrates for micro-organisms to thrive on and so a filter system is needed. It provides a type of surface for micro-organisms to attach to and eat plant and animal matter floating around in the water. Filter and pump system are only really essential if you want to keep Koi fish. They work to control algae levels. A solar fountain can be enough to keep the water moving and sufficiently oxygenated on hot days. In a natural pond micro-organisms are present in high abundance. They exist in the soil and on plants. They function as a ponds ‘vacuum cleaner’ living off plant and animal organic matter found in the water and turn it into nutrients that aquatic plants need to thrive. Micro-organisms play a vital role in keeping the system in healthy equilibrium. In garden ponds built using a protective underlay and pond liner the presence of micro-organisms is greatly reduced. Pond liners are necessary for the containment of water but intervention needs to be put in place to ensure that the quality of water is maintained in the absence of those microbes. Dead animal and plant matter is removed from the water by a pond filter and pump before it decomposes. Decaying matter will increase the nutrient levels beyond what is needed. There are a number of steps pond owners can put in place to reduce nutrient levels. 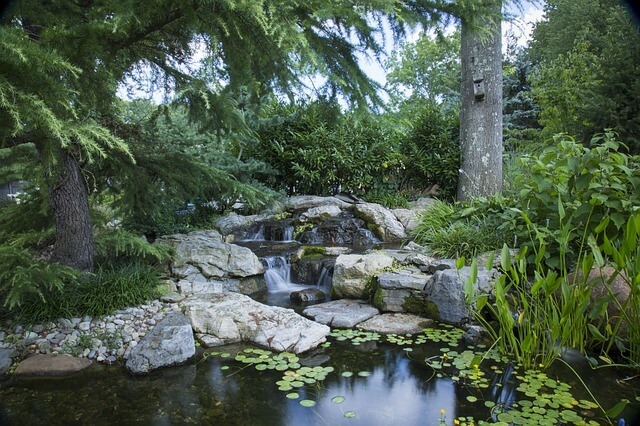 Include sufficient aquatic plants to cover at least a half to two-thirds of your pond surface. This will reduce the amount of sunlight entering the water and will use-up nutrients in the water leaving less for algae to thrive on. Plants also offer a substrate for micro-organisms to live off. Plants take-up nutrients in the water leaving little for algae to thrive on. The correct size pond pump is one that will circulate at least half the volume of water through the filter every hour (gallons/hour). So, a 1500 gallon pond would need a pump that can filter 750 gallons per hour for sufficient oxygen supply to plants and fish. A koi pond needs a pond pump that will cope with the amount of waste excreted daily. Pumps work off mains electricity supply drawing in water and pushing it out again by means of an impeller driven by a motor. A submersible pump is suitable for fountains, waterfalls and filter systems. They require regular maintenance to avoid debris build-up in the filter which could cause the motor to burn-out from over use. This entry was posted on October 4, 2018, in Garden ponds. Bookmark the permalink. ← Why fish huddle together at the bottom of a garden pond?